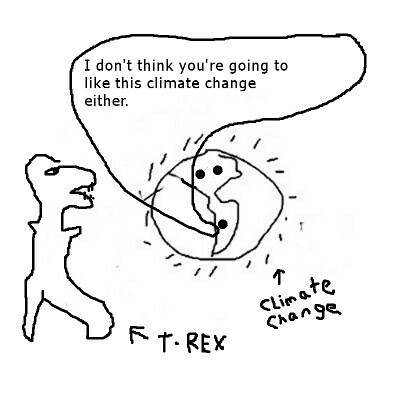 Environmental Thoughts - Rochester, NY: Can dinosaurs save us from Climate Change? Can dinosaurs save us from Climate Change? One of the recent developments in paleontology is the possible resurrection of the dinosaurs. As fascinating as realizing a Jurassic-Park scenario may be, I’m not so sure spending our time and money on such an ‘accomplishment’ is such a good idea. As our world quickly and disastrously warms, our best and brightest should be finding out exactly how Climate Change is most likely to unfold and how we can adapt to that. Stopping and maybe even reversing Climate Change would be good too. 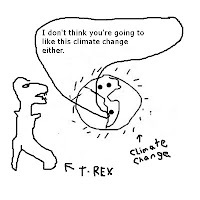 Besides being a mob of rapacious creatures that kept our ancestors rat-sized for millions of years, T-rex and the whole family of dinosaurs (actually of the clade Dinosauria) were victims themselves of a climate change. They didn’t adapt to the climatic changes that came as a result of a 10-mile asteroid plunging into our planet, blanketing the skies with sun-blocking soot. They died off wholesale. If anything, bringing the dinosaurs back to a world we are warming up would most likely make the world better fit for them, not us. This idea (albeit a remote one) of bringing back dinosaurs reminds me of the present attempts to bring back another fossil of sorts, a living fossil. In places like Rochester and around the state there is a concerted effort to bring back the large populations of lake sturgeons we used to have. And another thing, shouldn’t our media tell the whole story about reintroducing wildlife into our environment, an environment that is getting warmer and perhaps not suited for some species that used to thrive in our past environment? Wouldn’t it be wiser to help the species we need to foster critical ecosystems by prioritizing efforts to provide passageways through our urban areas and infrastructures, so that they (and we) can adapt to Climate Change? Don’t get me wrong, I don’t mean to disparage either dinosaurs or sturgeons. They were very cool in their day. We can learn a lot about adaptation from these creatures, but our focus should be on the creatures we need to survive the great warming we have created.